The item Age of Darkness, Volume one, (electronic resource) represents a specific, individual, material embodiment of a distinct intellectual or artistic creation found in Lawrence Public Library. The Age of Darkness descends upon the Grimm Universe and Sela Mathers is on a collision course with the most threatening evil she will ever face! 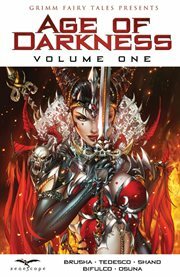 The Dark Queen has risen again and leads the Dark Horde into war against those sworn to defend Earth. Can Sela find a way to protect what she holds most dear even when all efforts to save humanity seem futile?